Big Give has arrived. Seize the moment and help us reach 88 donations for I-House today! 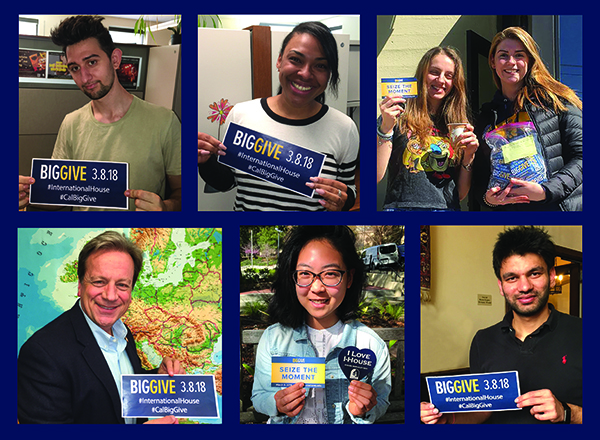 UC Berkeley’s Big Give, a 24-hour online fundraising blitz has started! All online donations made to International House today till 9 pm PST will go towards Big Give. If you’ve already made your gift, THANK YOU! If not, you can make a gift to I-House and be one of the first 88 donations that will be matched with an additional $100. Go to our website and social media outlets to check our matching challenge progress and the fun we are having at I-House! We will be posting special I-House moments throughout the day. You can add yours by sharing a photo or short video on Instagram and Twitter with both #CalBigGive and #InternationalHouse hashtags. Photos will be added to our Big Give 2018 album on Facebook. Your generous support will benefit The Fund for I-House, a valuable resource that provides life-changing scholarships, inspirational programming, and maintenance to our historic home. This entry was posted in Activities and tagged alumni, Big Give, CIL, Gala, I-House. Bookmark the permalink.